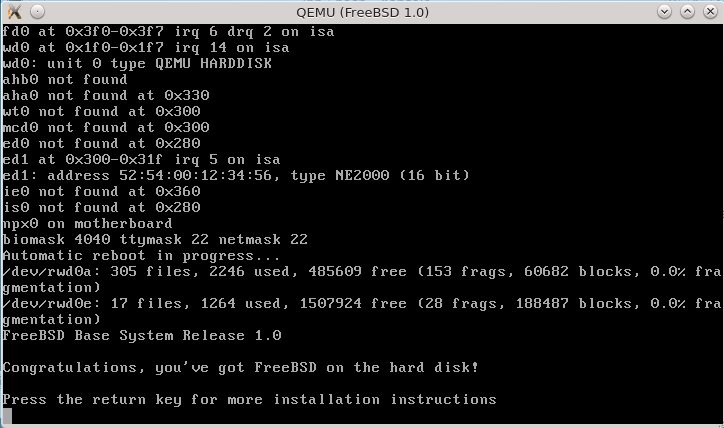 FreeBSD Now! : Happy 20th Birthday FreeBSD! 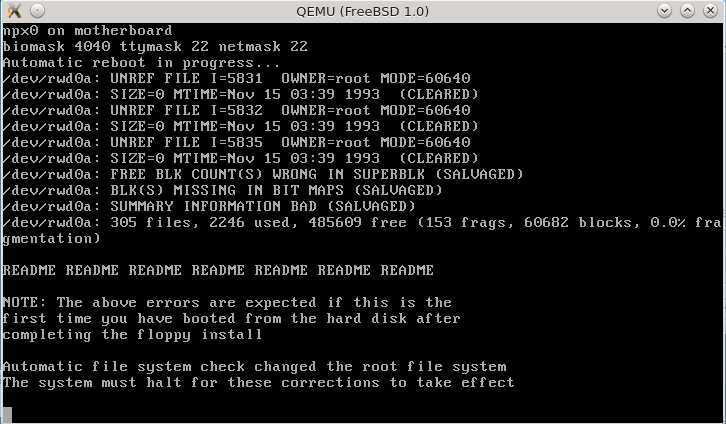 In honor of the 20th birthday of FreeBSD, we've reconstituted FreeBSD 1.0 on Qemu. We had some help from Warren Block's post. Nonetheless, it was a significant challenge. Here's how we got it up and running. If you're up to the challenge, grab the ISO and give it a whirl. In case you just can't get it working, I've included some links to a working Qemu image at the end of this blog post. If you just want to copy and paste, be aware that just copying and pasting the examples below from this website may introduce extra lines or characters. Copy first to a local text file and clean up as needed. # Set up a working directory and disk image name. # Also setup some handy environment variables. # all the files to a directory we will later use for FTP. # Qemu image format. 2GB is plenty of space. # and MS DOS option (n), and if you want a verbose install (y). # about 500MB (1000 sectors) and the /usr filesystem the rest. # Everything should work (partition and newfs). # and formatting can take 20 minutes or longer. # Grab a cup of coffee and check your email. # return at the guest reboot prompt. # For the 2nd boot - just hit RETURN on the disk switch prompt. # Enter "copy" at the kc> prompt, and "wd0a" for the disk. # Files are copied from the floppy to the hard disk. # 'n' for "Install optional dos floppy?" prompt. # Enter 'halt' to reboot. # You need networking for the next step. # and start an FTP server on the host. # Add devices to the bridge. # Replace em0 with your network interface on the next line. # These sysctls allow a user program (Qemu) to open the tap device. # Make sure the bridge is actually running! # Now boot from the hard disk. No floppies needed. # not been checked and will run fsck to check it. # and will then reboot by itself. # "To finish installation:" screen. # It's now time to load all the tarballs. # on the Qemu guest and FTP back to the host system. # that works best for you. # Commands indented below are entered on the GUEST, not the HOST. # check the TAP interface onthe host above. # both tap0 and bridge0 devices should be UP. # and get the files you need. # 30 minutes for some tarball extractions. # This file will extract all of the FreeBSD binaries into /. # because each has it's own EXTRACT.sh file. # and run the command "configure"
# Now halt the guest system and shut down Qemu. 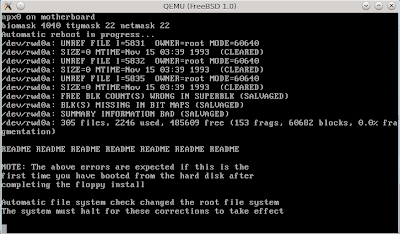 # Hopefully, you now have a working FreeBSD 1.0 system! # Note that, by default, there is no root password. # Please set a root password if that is a concern for your system. Use the last command line above to run. The above demo works with VLC. Sound under Firefox may not work.